M Speed assists in "TEAM TETSUYA". The SuperTaikyu report in 2008 is here. 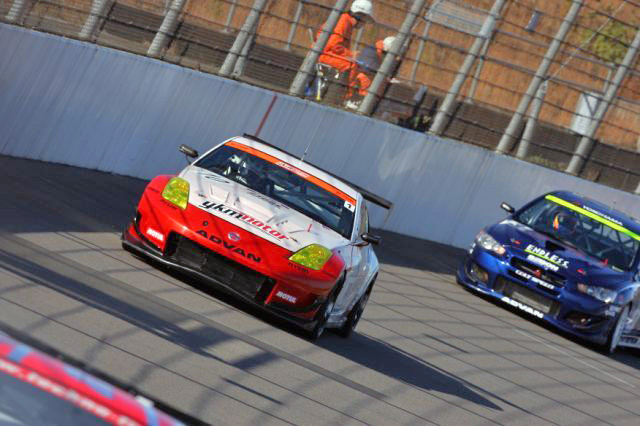 The SuperTaikyu Round 8 was done at Twinlink-Motegi in Tochigi on November 28th,29th. SuperTaikyu Final Round became holding by an oval course for the first time by the official race. At first, the series ranking went up to 2nd place by having enumerated the second victory in the seventh game at this season though "TEAM TETSUYA" did not schedule the participation of Final Race, too. They in haste decided participation in the rally by hoped for the title acquisition having tied now though differences with top # 1 were 16 points and severe situations. "TEAM TETSUYA" was hit the wall while running and crashed by the official game in the first, oval course though was important two practice running done on Saturday. It is not possible to run, and the preliminary contest is received in the second running without the setting's being condensed enough. The preliminary contest was the next Sunday. A driver drove for 15 minutes, B driver drove similarly for 15 minutes, and C driver drove for 20 minutes. However, it becomes a result time's being greatly separated by BMWs by the crash the day before probably because of lack of practice. 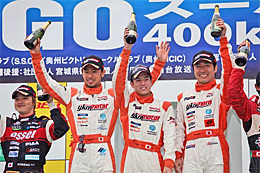 The grid of the final was decided at A driver and B driver's addition time, the second race became second-time as for the first race at the best time, and "TEAM TETSUYA" stayed in two races and the fourth grids. The interval was placed from the preliminary contest for only two hours, and the first race was played. It retreated again in # 35, and "TEAM TETSUYA" that had started from the hand by Driver.Yokomizo the fourth was exchanged, and retreated fourthly in the tenth times the 14th times though went up to exchanging 3rd place in # 35. It reached a goal in 4th place though the pit in was done to the 18th times, alternatively to "Player Sato", right tires were exchanged, and it caught up. #1 won the championship, and the series champion decided the second without racing. 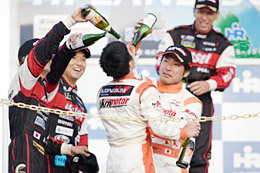 The second series ranking place was defended to the last though the second race that had been played two hours later became a result in which 4th place as for "TEAM TETSUYA", too. The corner of BMWs who was the powerful enemy was destroyed. The hope for the champion acquisition was connected, and the chance was gotten in haste though participation in Final Race was not scheduled. The target was switched and faced to managing greatly secure the second series place more than the expectation by damage in the crash of the practice running at that time. The setting was not able to be done naturally, and two races and 4th place were utmost results though it was possible to go out to the preliminary contest and the final by the favor at which the inside and all staff of the situation whether the restoration was in time by tomorrow worked hard. 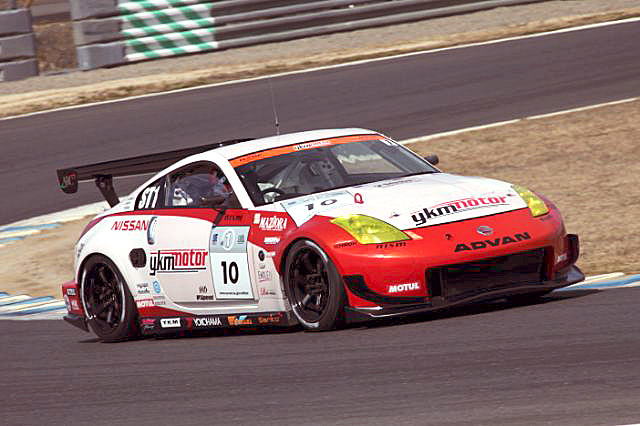 However, being able to acquire the second series place by suppressing one in BMW2 that showed an overwhelming speed was very big value, and became our confidence. We wish to express our gratitude to the mechanic who always prepared the machine well though it was a situation that it is possible to win the championship when BMWs still has the trouble. There was helped what in the speed and the accuracy of their pit practices many times, too. Moreover, I think that two young drivers also worked hard well in this severe situation. However, the experience absolutely thinks that it is provisions, and I think that doing easiness and winning greatly developed times them how many. The preliminary contest starts by a wet condition though rain stopped before it begins to run. 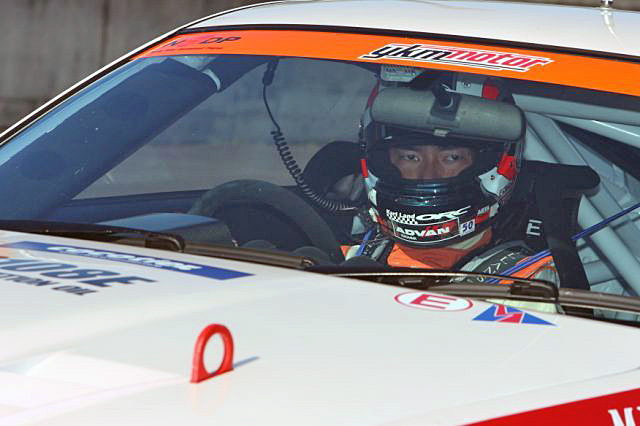 First of all, A driver's player Yokomizo touches the third. Afterwards, TEAM TETUYA installs racing slicks by player Sato's of B driver attack, and aims at the reversal pole position acquisition because the weather has recovered, too. However, timing was early or the time of the machine that will install [reintaiya] by the last stage of the session cannot be exceeded still, and it sinks in the 15th synthesis place. The course condition recovers at a dash after the preliminary contest ends, and the final race after three hours receives the time of the start by a complete, dry condition. It catches up by a good pace, and player Sato of TEAM TETSUYA who became a start from a middle grid raises the sixth positions to the hand, and gets to the seventh times the imposition of drive-through penalty here by the foul start. The 12th TEAM TETSUYA that became starting over from the hand surfaces to the hand by two high ranks retirements afterwards and the 2nd retreats due to the trouble. Player Yokomizo corners # 35 in addition, and it springs up in the top finally the 62nd times. Player Tanaka who gripped the steering wheel from the 66th times also pulls # 35 apart further, and the second victory is splendidly enumerated at becoming it this season, and the series ranking surfaces to 2nd place since then the second game, too. 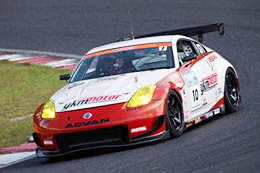 Final Race Motegi bets the title, and it ..oval course.. fights. I think that two BMWs power is a result of [dai] ....the second place.. peel.. good fight of the series in put inside and one remainder game of the overwhelming speed showing though it is continuation of fighting hard up to now. I think that this is a result that had been fought against the speed of the strategy and a pit practice in the team united body like accuracy etc. As for the race, what happens is not understood though it is disadvantageous because Final Race Motegi becomes a race by an oval course overwhelmingly compared with the BMWs power on the characteristic of the machine. Especially, I want to aim at the win without giving it up to the last minute because the endurance race is one of the important elements also for running to win constant without the trouble and the accident. TEAM TETUYA that acquires the third grid following two BMWs power. When player Sato starts racing, # 35 of the same Z power and an intense third hand duel are unfolded. #The chance in the moment is pierced, and the fifth hand # 25 ..two.. surfaces to the exchanging ..the third.. hand at a dash though it was player Sato who suppresses it as 35 is desperate. Because the third hand duel by three continued afterwards, TEAM TETSUYA evades the consumption such as risks generated by the confused fight and unnecessary tires by the pit stop of bringing forward. Times of surroundings are piled up by an own pace, and it applies it to single the third place at the latter stage of the race. Is it one in the BMWs power?This strategy that greatly moved the timing of another car and the pit stop was effective, and the 3rd place victory stand was acquired though two had been permitted. 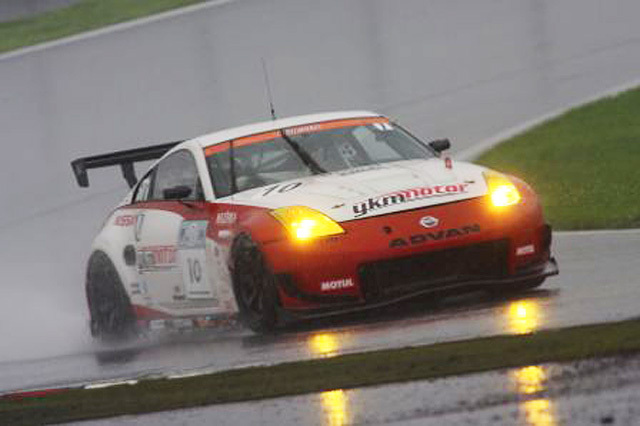 Four hour of fifth game Fuji endurance became a longest race of the series from the cancellation of the race of 24 hours in Tokachi when it was scheduled to be done in July at this season. It surfaces to the hand secondarily in the latter half of the race in the final race of Sunday that became rain though it is sinking TEAMTETSUYA ..the had hand in the preliminary contest by the fourth.. under a dry condition on Saturday. However, the mission trouble occurred in the 78th times, and it became a regrettable retirement. It became a painful no point because it had surfaced to a series top ranking by the pre-war. The SuperTaikyu Round 3 was held on at Suzuka-Circuit in Mie on June 6th and 7th. The practice running on Friday marks top time by driver Sato in a wet condition, and appeals to TEAM TETSUYA that splendidly decorates the victory with the second game for the good condition. 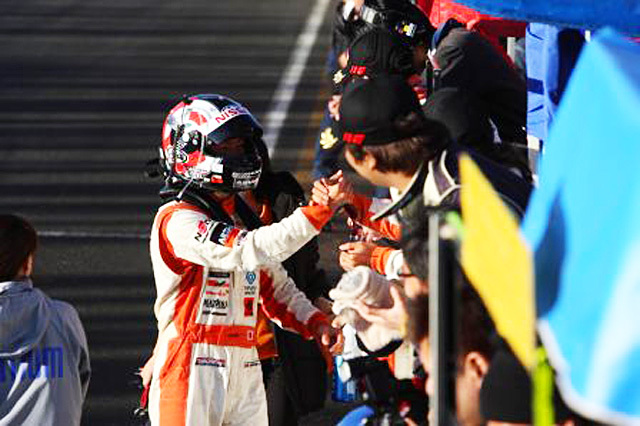 However, Driver Sato of B driver violated the mistake of deep regret, and pole position was not able to be acquired on Saturday the next day that became a dry condition though Yokomizo applied in the top in A driver's preliminary contest. They became the starts from the second. Driver Yokomizo starts the final race given to fine weather from the front row. However, some is delayed starting, and the fourth opening laps retreat to the hand. Afterwards, they passed # 35 asset Techno-First Z the 12th raps. Safty-Car is introduced into the morrow, and it becomes an unlucky thing here with advantageous development for the BMWs of timing for the pit of the first time to stop well though the pit stop of the first time is done to the 24th raps of bringing forward. However, Driver Sato who took charge of the second stint develops an intense second duel when excelling at the pace compared with the second # 28 PETRONAS SYNTIUM BMW Z4M, and putting it in the range range gradually. Two came in contact with the 49th raps that had entered the latter half of the race though he watched for the chance of Over-Take back. 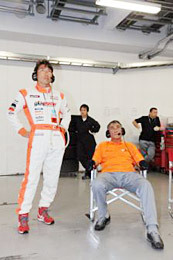 This is considered to be Driver Sato's dangerous act, and the penalty stop of ten seconds is imposed. Pursuing begins though it seemed that the conclusion had arrived at the second hand duel by this when Driver Yokomizo grips the steering wheel by stopping the pit the second. The difference that was for # 28 and 22 seconds of second is shortened at a dash, and it brings it in in the state of tail to nose. The time of surroundings delay is a machine and comes in contact not collecting of # 28 from which it runs away when it keeps multiplying pressure back in addition. A drive-through penalty is imposed on # 28 for this act, and Driver Yokomizo who sprang up to the hand secondarily is checkers as it is. The top of the Ponto ranking was defended to the last. Driver Yokomizo and Driver Sato were showing a preliminary contest, a final, and a good running. However, it is regrettable that the mistake was seen in parts. # 1 won the championship would not have been a far-off other party if there was no mistake by the preliminary contest and the final though there were an advantage and a disadvantage of development that BMWs had stopped the pit of time first, too. It is thought that of each was able to confirm the problem, and I want you to be going to tie the experience of this time firmly again in the future because it thinks that the size of the influence that one mistake gives was able to be felt strongly this time. The team supports a young driver by perfect work, and it is, and two young drivers also are answering it by a brilliant running. Morale in the team has risen, too and I want to tie to the result it firmly. The SuperTaikyu Round 2 was done at Sports-Land-Sugo in Miyagi on May 10th. Z was good from a free running on Saturday. 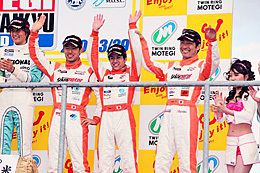 Top time was "#35asset Techno First Z(Maeshima/Sasaki Team)". TEAM TETSUYA (Yokomizo/Sato/Tanaka Team) comes second following them. On the other hand, an overwhelming speed like the situation to date was not thought to be the same class in the performance adjustment's BMWs's that had shown off the difference of not being possible to think having been done at this season last year. The weight adjustment might greatly influence in SUGO that the vertical interval of the course is especially large. They became The 3rd and the 4th by the little difference. Also in the preliminary contest that had been held on next day morning, Z was as good as the practice running. 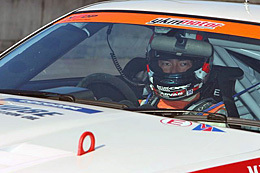 Driver Yokomizo of TEAM TETSUYA marked A driver's top time. Driver Sato of B driver also marks top time in answer to it, and the first pole position is acquired splendidly at this season. #35 mission trouble occurred in the last stage of the preliminary contest is the 2nd and 2 BMWs continued to it. And, # 1, # 28, and 2 BMWs secedes to the middle stage of the race the front in succession in the final race due to the machine trouble only immediately after the start though an intense, top duel by 2 Zs and 2 BMWs was unfolded. The victory fight came to be squeezed to two Z. 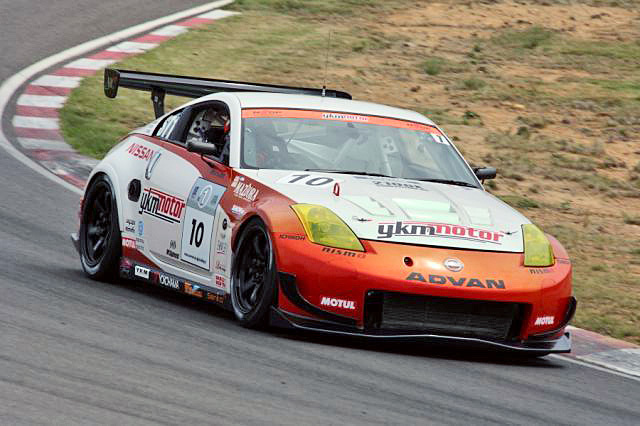 However, it becomes a latter stage of the race, and the trouble occurs very much in another Z#35. Inside and TEAM by which rivals disappear one after another TETSUYA piles up times of surroundings well, and Driver Tanaka who in haste gripped the steering wheel by the safety car introduction is top and checkers. The team first formation victory was decorated, and the series ranking became top. Your a lot cooperation was gotten from last year's team formation, and, at last, it was possible to report on the first in team victory. The first victory as the supervisor was the re-different from the time climbed the victory stand as a driver, and had the pleasure that was not able to be said indescribably though had tasted the moment of the victory up to now by various categories. Moreover, I will also in haste get on in the place where [seifutei;ka-] entered though the race was going to be left to Yokomizo/two Sato in the first schedule. 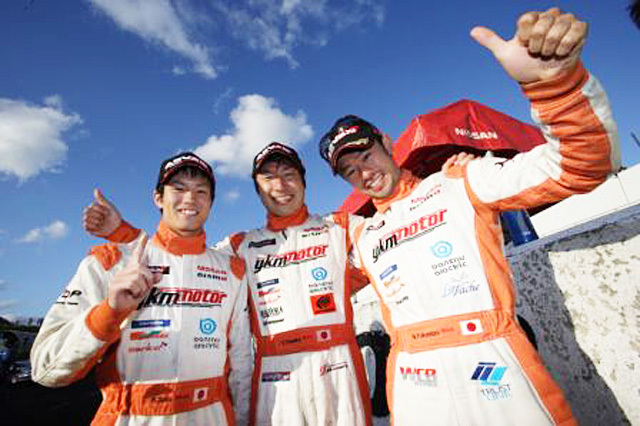 It was also lucky that I was able to grip the steering wheel as a driver by the race of the team the first victory. The chance was able to be made the one without when the BMWs power to have boasted of overwhelming strength up to now fought hard due to & trouble in a slump defeating by the no no trouble mistake it. I want to continue this power to Final Race though it became a point leader at a dash this time. The SuperTaikyu opening game was done at Twin-Link-Motegi in Tochigi on March 29. TEAM TETSUYA of last year is formed, and as three, it is an owner of the team, it is a supervisor, it is a driver, and it is Tetsuya Tanaka who has fought as for the season. 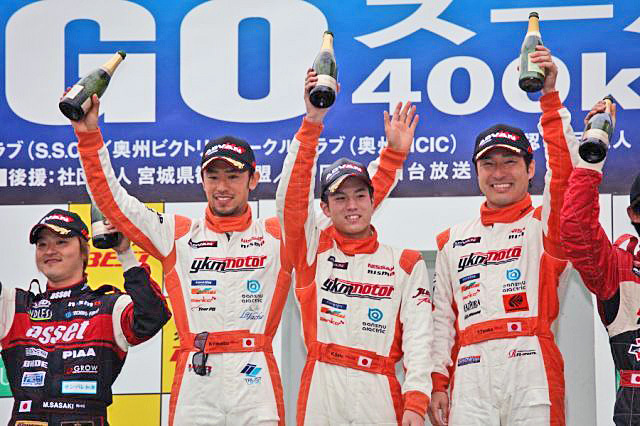 It came to invite two young men of Naoki Yokomizo driver and Kimiya Sato" driver as the driver newly, and to enter the war by Tanaka/Yokomizo/Sato's driver lineup at this season of the second year of the formation. It was given to fine weather, and it became the splendid race weather on Sunday that placed the preliminary contest and the pit walk in the morning and became a final and a hurried day in the afternoon. It is Yokomizo and it is Sato in the preliminary contest fought at similar of last year and A driver and B driver's total time. # 35asset of same Z though faced by both drivers. It did not slightly reach Techno First Z(Maeshima/Sasaki class), and it became 4th. The final race starts by driver Yokomizo, and continues running devoted to the inside and the tire keeping that other three develops a top duel from the early stage of the race. Long [sutei;nto] is digested, and it applies it to the latter stage of the race in the top though driver Sato who continuously gripped the steering wheel is a rookie, too. However, because two pit stop and driver alternations are obligated while racing at this season, it is ten times of the remainder and pit stops. 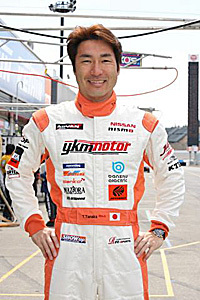 Driver Yokomizo returns to the course by the hand thirdly in not doing the tire exchange and having suppressed the loss at time to the minimum in the pit stop of these times second in the BMWs power in this though it is exchanged. # 35 of same Z was suppressed, and the 3rd place victory stand was acquired. It became participation that invited two young men as the driver this year of the second year of the team formation. 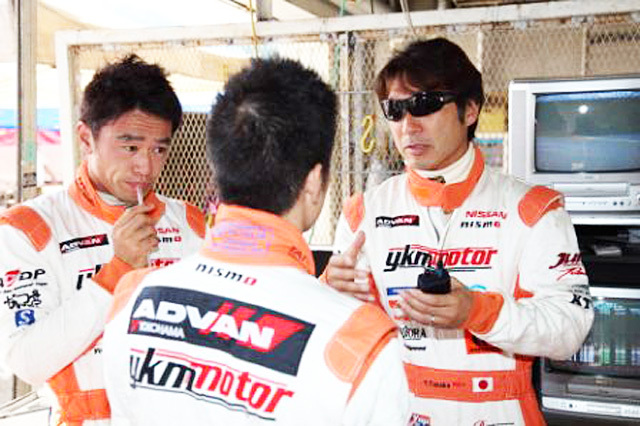 Especially, driver Sato also who was the pupil of FCJ wants you to study different how in this team from a formula car and the Sprint race to fight because the touring car, the endurance race, and this year are the first time. Moreover, the stern is trowed might being able to do more concrete advice by fighting ..race.. both as "Driver of the same team" though it was a standpoint "Lecturer" up to now. It of the difference of power with honest BMWs is few at the chance to win quite greatly as long as it is not a trouble either. The trouble is also a little because it races with [katoitte] and BMWs also left some reserve strength … Not making a mistake is the lowest condition that we do not put out the trouble to defeat the other party in such a situation though it is a quite difficult situation. It is necessary to decrease both differences of running to make very few chances the one surely because there was a mistake this time though it is not large. I want to advise that you can firmly build foundation as two young drivers though it always sticks to the match in the same Z power aiming at top even if it is the lowest. Copyright©2008-2009 M Speed All rights reserved.